Reinforcement Learning (RL), one of the most active research areas in artificial intelligence, is a computational approach to learning whereby an agent tries to maximize the total amount of reward it receives while interacting with a complex, uncertain environment. 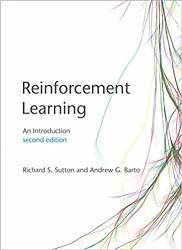 In Reinforcement Learning, Richard Sutton and Andrew Barto provide a clear and simple account of the field's key ideas and algorithms. This second edition has been significantly expanded and updated, presenting new topics and updating coverage of other topics. Like the first edition, this second edition focuses on core online learning algorithms, with the more mathematical material set off in shaded boxes. The treatment to be accessible to readers in all of the related disciplines. Part I covers as much of reinforcement learning as possible without going beyond the tabular case for which exact solutions can be found. Many algorithms presented in this part are new to the second edition, including UCB, Expected Sarsa, and Double Learning. Part II extends these ideas to function approximation, with new sections on such topics as artificial neural networks and the Fourier basis, and offers expanded treatment of off-policy learning and policy-gradient methods. Part III has new chapters on reinforcement learning's relationships to psychology and neuroscience, as well as an updated case-studies chapter including AlphaGo and AlphaGo Zero, Atari game playing, and IBM Watson's wagering strategy. The final chapter discusses the future societal impacts of reinforcement learning. This book is the bible of reinforcement learning, and the new edition is particularly timely given the burgeoning activity in the field. No one with an interest in the problem of learning to act - student, researcher, practitioner, or curious nonspecialist - should be without it. Richard S. Sutton is a Canadian computer scientist and a Professor of Computing Science and AITF Chair in Reinforcement Learning and Artificial Intelligence at the University of Alberta, and also Distinguished Research Scientist at DeepMind. Andrew G. Barto is a professor of computer science at University of Massachusetts Amherst, and chair of the department since January 2007. His main research area is reinforcement learning.